mysms is a freeware application which allows users to send text messaging using your personal computer, tablet or cell phone. Similar to services such as WhatsApp, mysms can be used from virtually anywhere though unlike WhatsApp, this program is free to use forever. 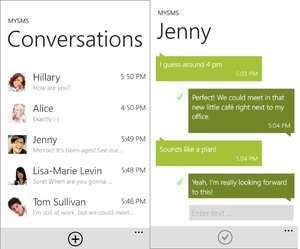 Aftering starting mysms in Windows, it is simple to use, while creating messaging just involves typing in a contact name and you're ready to go. In addition, mysms also automatically synchronizes with your cell phone and tablet so that you're up-to-date wherever you are. For security reasons, you should also check out the mysms download at LO4D.com which includes virus and malware tests. Additional screenshots of this application download may be available, too. mysms has a presence on social networks.